A few months ago, I started a diet. It was right before the holidays and I debated for a day or two about the merits of waiting to start the diet after turkey and potatoes and Captain Morgans and pie and pie and pie. And from somewhere in the black abyss of my soul a small speck of light flittered forth and wedged itself into my brain folds. It spoke to me and said, "Right now is the hardest time to start. If you start now, you are bound to succeed." Because this was a good idea, my brain immediately smothered it. But it was too late... I started my diet in late November. I was 228 pounds. After two weeks, I dropped about seven pounds. My boss Erik couldn't help but notice and I would often catch his eyes lingering on my increasingly svelte form. 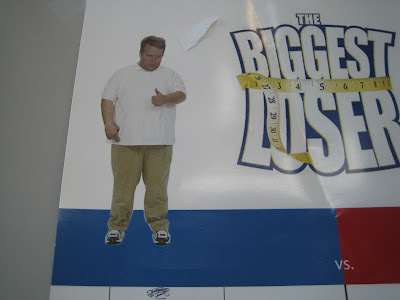 It was at this time that Erik and I began our own personal Biggest Loser competition. With a $4.78 scale and a gentleman's bet, we began the competition with a finish date of tax day, April 15th, 2008. 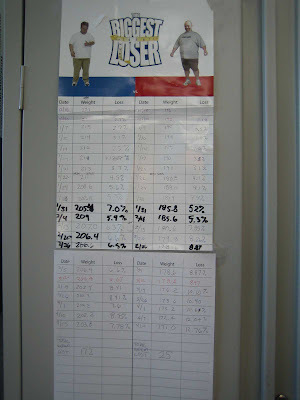 Stephanie made us a poster to keep track of our weight. These are the actual before photos. 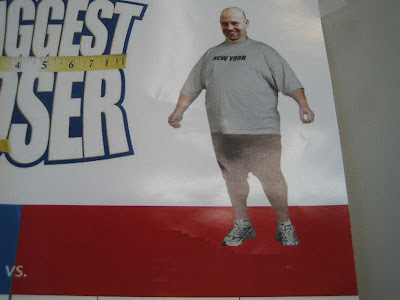 Erik wins with a total weight loss of 25 pounds or a 12.76% loss. I came in second with a total weight loss of 17.2 pounds or a 7.78% loss. Even when you add in the weight I loss before this competition began, he still won! Did he cut off an appendage? you guys have entirely too little to do at work.